King Kong the Musical on Broadway tickets can be easily purchased online. I recommend buying your theatre tickets before you travel to New York as it saves time and money. Go to the Broadway Theatre to see this show! The musical King Kong is based on the book that stems from the 1933 movie of the same name. It tells the story of prehistoric gorilla, Kong, who develops an emotional bond with the woman he kidnaps. King Kong the musical is a modern-day version of the classic story, ‘Beauty and the Beast’. Jack Thorne, also famous for his work on Broadway hit, Harry Potter and the Cursed Child wrote the script. In addition, Australian singer–songwriter Eddie Perfect composed the music for the show. Obviously, the starring role is the gigantic gorilla; brought to life using infrared technology and a number of human performers. In contrast to the actors on stage, Kong does not speak or sing, although he does make some lifelike noises. 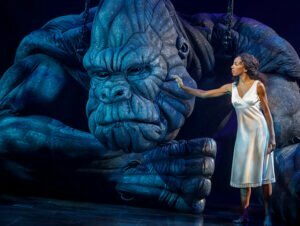 King Kong on Broadway is a real musical with singing and dancing, but better described as a spectacle! 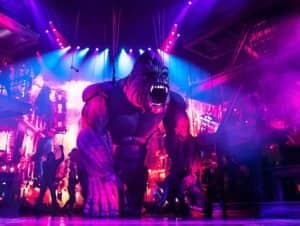 How to buy King Kong the Musical tickets? It is easy to buy tickets for King Kong the Musical with the link below. I recommend buying tickets online before your trip to New York. Why? A lot of shows are very popular and are often sold out. You’ll also save time and money and most importantly you don’t have to stress about finding tickets when you are in New York. Send me an email at eric@newyork.com.au if you want to book for groups of 10 or more. Eric’s Tip: The special effects in this musical are fantastic. Especially impressive is the huge gorilla on the stage. I also recommend this musical if English is not your first language; the well known storyline makes the show easy to follow. Don’t want to see King Kong?